There is usually a beautiful selection of artificial autumn leaves in the craft stores and bargain stores every autumn. 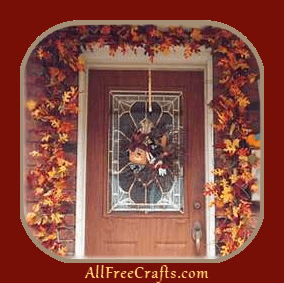 The warm, golden colors in a homemade garland of fall leaves can brighten interior spaces, or highlight an entry door, as shown here. I used approximately 35 bunches of leaves that I purchased at our local dollar store. I also added a few bunches of fall colour stems, also purchased at the dollar store. This garland that runs more than 35 feet was very economical to make and it looks spectacular draped around my front door. To assemble the garland, lay the leaf bunches out in the form you would like them assembled. Use our photos as inspiration, but create the garland in the way that looks best to you. Beginning at one end, wire one stem of leaves to the other creating a running length. Be sure that you wrap your wire securely between leaves and stems to prevent it from undoing. As I went along, I wired a few additional stems between the leaves, that were cut from bunches – as you can see in the photo at left. You could also add in some natural elements, such as pine cones, wiring them to the stems as you go. Copyright &copy 1999-2012 Susan Spatone All rights reserved.